Minutes from skiing and casinos and offering free Wi-Fi and an outdoor pool the pet-friendly Budget Inn South Lake Tahoe is a comfortable value-priced stay for our guests looking to be in the heart of area attractions. The small friendly Budget Inn offers 25 rooms on one level. All come with free Wi-Fi local calls and cable TV with HBO; some have a refrigerator and a microwave. Pets are welcome for an additional fee and non-smoking rooms are available. Guests enjoy free coffee in the inn's 24-hour lobby as well as the use of a laundry room. A seasonal heated outdoor pool offers the chance for a refreshing dip. Parking is free. Located on U.S. 50 the Budget Inn is just three minutes from Stateline casinos and Heavenly Village â?? a great place to shop or to catch the gondola up to Heavenly Mountain ski slopes. 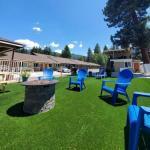 Lake Tahoe is just a block from the Budget Inn with beach access at Regan Memorial City Beach two minutes away. The Budget Inn is 58 miles from Reno-Tahoe International Airport.